The college admissions process was like a filthy dark fog that descended on my home after Christmas when my oldest son was a junior in high school and did not lift until my youngest son was a senior. Like the insidious smog that covered LA during my childhood, this process was toxic and clouded my vision. And like the smog, although we survived it, and almost came to accept it as normal, it is only now, after the fact, that its ill effects can be seen. College admissions is viewed in many circles as the ultimate report card on parenting, a single, permanent letter grade given at the end of 18 long years of loving effort. If college were merely four years of a person’s life we might be able to gain some perspective, but rather it is as if we are all, parent and child, car rear windows with college decals forever affixed to our foreheads. No one has ever asked me if I raised three good men, caring sons or fine citizens. And, as an equally bone-chilling counterpoint, I have never met someone who upon learning that I (or any other parent) have college age kids has not asked which school they attend. If you doubt for one minute how much college matters in some circles, stand in the middle of Bed, Bath and Beyond and hold a package of twin XL dorm sheets in one hand and a power strip or under bed storage container in the other and wait to see how long it takes before a perfect stranger pops the question. Bruni’s book is the voice of sanity in a process gone amok. In his searingly well written prose, he weaves together data to show that those who have achieved at the highest levels in every walk of life are alumni of almost every type of university. Bruni shares the mountain of research that shows what a student studies and the effort they bring to the task matters more than where they studied. He bolsters these facts with stories of the accomplishments of nationally known individuals who attended little-known colleges. The combination of these facts and stories makes our heedless desire for elite education seem utterly misguided. The first part of Bruni’s book is terrifying reading for high school parents. The college admission process feels like it is an arms race, because it is. A confluence of demographics, technology, globalization, marketing, rankings and other factors have made getting into many colleges harder than ever. He recounts the advantages bestowed on legacies, athletes, and others. He offers terrifying examples of high school parents on their very worst behavior. He looks at the lengths at which parents will go to in order to “package” their child for an elite admissions office. He delves into a nation obsessed with sorting people into tiers, brandishing personal brands and using labels of every description to indicate status. College admissions has fallen prey to all of these insidious social trends. It is frightening stuff for anyone who has a college-bound child. answers the questions that keep high school parents up at night and reading it will let you sleep better. As in his well shared editorial, presumably the inspiration for the book, Bruni takes his readers on a journey to show them not that the competition isn’t as bad as they fear or the system as flawed as they think, but rather that the entire frenzied episode matters far less than most believe. Chapter by chapter Bruni dismantles the edifice constructed over the 20th century and fortified dramatically in the 21st that there are a few great universities and that through them leads the one true road to success. But that leaves the question of whether parents are unmoored in caring as much as they do about their child’s college admissions. I think this question breaks down into two parts: does it matter at all where our kids attend college and is there any damage from caring? The answer to the first question is, it doesn’t matter nearly as much as we think, but that is not the same as saying it does not matter at all. Parents are obsessed with well-regarded universities, not because they believe that there is no other route to their child’s dreams except through an elite school, but rather because the chance of taking that route is more likely, and only likely, from a more selective school. As parents we are not crazy to care which university our children attend, but we are insane to care as much as we do. But as a parent who has recently endured this process I think Bruni lets parents off the hook, a bit, and gives us a pass for our own crazy behavior. Part of what make us crazy is everyone around us going crazy. Although, as parents, we are allowed to stand up and say “I won’t fall prey to this,” very few of us do. Equipped with a lifetime of experience in school and the workplace that shows us unequivocally that Bruni is correct and that, with determination and effort, you can get almost anywhere from almost anywhere, we fail to acknowledge what we see and instead focus on what we fear, that those who have graduated from elite institutions might have an inside track. This type of thinking seeps into our parenting infecting our attitudes and actions. If we see the world through the prism of college admissions it can alter the decisions we make about how our children spend their time and add stress to already stressful time in their lives. The more important college is to us, the more pressure our children will feel. When selective college admissions becomes a goal, it is all too easy to push and nag, to stress and worry and to forget that all we can ask of our kids is that they try their best and are good people. 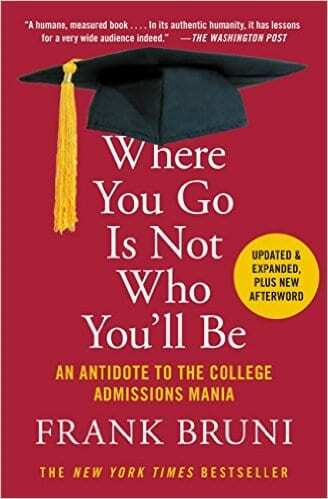 As I said in the beginning, college admissions is a fog that can easily discolor our thinking and alter our parenting in ways that damage our families. Bruni’s book is what every parent needs, the reasoned voice of a dispassionate author who can see your situation clearer than you can. College counselors all over the country are surely rejoicing. If the college admissions process only affected parents of high school students his book would have an important, but limited, audience. But I am going to put it right out there and say that I thought about college long before my kids entered ninth grade and I am fairly certain I was not alone. The sad truth about our world is that this book is for every parent whose kids are out of pull-ups and aspires to have that tot matriculate, some day, at a selective university. Parents make decisions all along the spectrum of childhood that are colored by this aspiration and thus the message of Bruni’s book is one we can never hear too early or too often. As a mom who has hacked her way through the admissions jungle three times, I can attest that some of my, should we call it, excessive interest in my sons’ college process was brought on simply because I could feel my kids slipping away. It is far harder to face up to the fact that the intimacy we shared with our children while they lived in our homes will be altered, than it is to obsess on SAT scores. So we take our pain, or fear, or simply feelings of uncertainty and we focus on a process that seems to have an infinite ability to absorb our attention. But we do this at a cost. on Amazon or from Sunday’s New York Times, read an excerpt here. GF: I come away from the book feeling like where my kid goes to college is less important than I thought, but not entirely irrelevant. It seems that for parents the real danger comes from caring so much, that the parental investment in college, or worse a particular college, seeps into family life damaging so much of what goes on between parent and child. By setting narrow expectations, parents give their kids plenty of room to fail. Would this be fair? FB: First off, “less important . . . but not entirely irrelevant” is precisely the right takeaway. I think that’s exactly the correct way to put it. And what I’d say to the rest of your formulation is this: By setting less specific expectations, you give your kid plenty of room to succeed according to a less unforgiving metric. Admission to an elite school involves a very particular script: these advanced-placement courses, that SAT score, this athletic triumph, that community service. Your child’s distinction may not be accommodated by that script, so don’t tether his or her self-worth to it. That’s the way I’d put it. GF: The book mentions that an acceptance to a school like Duke or Northwestern is a “…binding verdict on the life that he or she has led up until that point…” referencing the student applying. Do you think the same could be said of parents, or at least the job they did as parents? I wonder if parents get a bit of a pass here. Isn’t college admissions perceived as a report card on our parenting? FB: I certainly didn’t mean to give parents a pass, and they shouldn’t get one. You’re absolutely right. Many parents see what happens during the college admissions juncture as a reflection on them. I say that not in a damning manner but in a sympathetic one: They’re products of the culture we live in, and they’re getting their cues from all they see around them. But, yes, admission to Stanford or Duke or Northwestern or Williams is the ultimate brag: the honor society and the athletic trophy and the lead in the school play all rolled into one. And kids pick up on how much what happens to them will mean to Mom and Dad. Someone told me recently that one of the Ivies sold, in its campus store, or on its website, a T-shirt or a sweatshirt that identified the wearer as the parent of a student at that school. That says it all. GF: Do parents really believe that admissions to a top college assures smooth sailing? As adults in midlife our experience has taught us the fallacy in this. As parents aren’t we looking for smoother sailing? Don’t parents aspire to a small edge that will make our children’s journey through life just a touch easier? Aren’t we just looking for something that will tip the odds of professional success, however slightly, in our child’s favor? FB: Parents, in the best possible sense, want to give kids as much of a leg up as possible in a competitive world, and they want to give them as much of a safety net. And they’re right to. That’s sort of their responsibility and job, if it falls within their powers. And parents indeed think that an elite school, with the connections and network that it can bring, falls into the categories of “leg up” and “safety net.” They’re not entirely wrong. In many instances and in some ways, an elite school does confer advantages. My point is that those advantages are nullified, and maybe even reversed, if a child buys too fully into the idea of them and shortchanges the quality and energy of the work done in college, and that’s a danger of too much belief in, and talk about, the importance of a school’s name. The danger is that you think admission is all and experience is secondary. If you adopt that perspective, even without meaning to, and you act accordingly, your elite school isn’t going to do much to increase your odds of professional success or ensure smooth sailing.